At Sugimoto Hamono, we do not consider knifes as throwaway products, but as tools that can be used for a very long time if cared for properly. What is a "real knife"? Japanese swords are known throughout the world for their sharpness, strength, durability and beauty. Sugimoto Hamono keeps this traditional craftsmanship alive our forged knives. Even today, each of our knives is carefully made by hand. you know how important this is in life. In this modern world of cheap, mass-produced items it has become commonplace for even the venerable kitchen knife to be treated as a "throwaway product." At Sugimoto Hamono, we make products that you will find truly easy to use and look after by yourself so that you will be able to continue to use them for many, many years to come. At any time you can ask us about how to sharpen your knife, how to use it and how to look after it. We can also sharpen or repair your knife for you, so that you will be able to use it longer. We also have a full range of knives for left-handed people. If we put your name on your knife, one of our craftsmen will inscribe it on the blade by hand. As a manufacturer that carries on the traditions of craftsmanship, we want to offer you the very best products that we can. 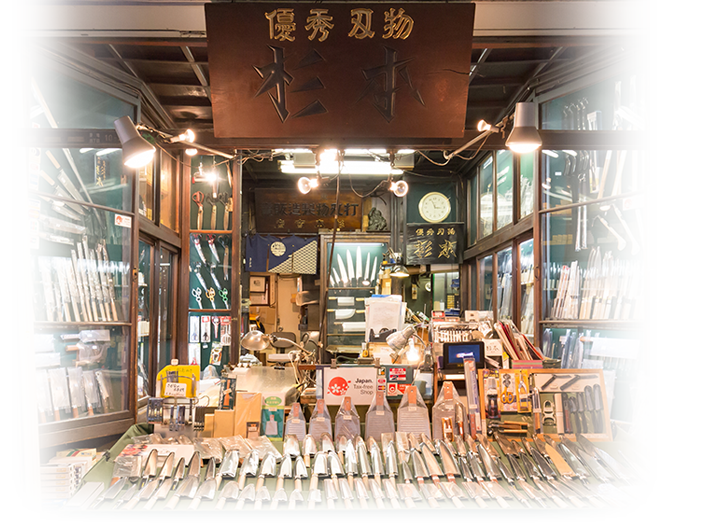 Japanese kitchen knives have been gaining attention from around the world for many years. More and more people are buying these knives online or even visiting our stores in Japan to purchase them. This in turn has encouraged the Japanese to rediscover the value of the phrase "Made in Japan." Nevertheless, there is a lot of misinformation out there and the market is flooded with products that are sold on their looks alone. Sugimoto Hamono responds to both domestic and international inquiries. Our goal is to tell people how to properly use, sharpen and look after their knives. We want to give people the correct information and we want them to experience the true goodness backing the "Made in Japan" label. If you visit our store and ask us, we will show you how to sharpen a knife and give you tips on how to look after it. Sugimoto Hamono wants to continue to deliver "traditional craftsmanship" to our customers.